Or is it, as the more cynical Chicago Tribune editorial board wrote two days ago, "as useful as a square-shaped wheel," and "will change nothing"? According to the editorial, this and two other citywide advisory referendum questions were used by Mayor Emanuel allies "to block a movement for an advisory referendum on whether members of the Chicago Board of Education should be elected" rather than appointed by the mayor (the Board of Ed referendum had to make it onto the ballot ward by ward because a maximum of three citywide referendum questions are allowed in an election cycle). 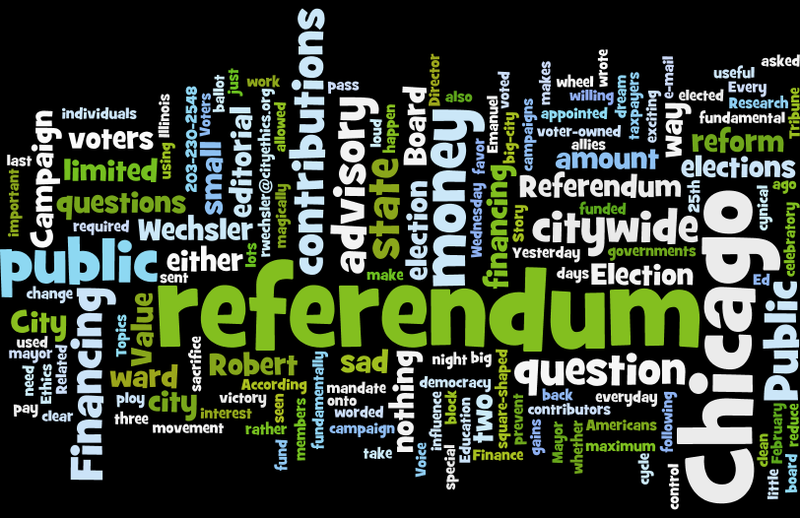 What makes me sad about this referendum is not only that it was a ploy to prevent what was seen as a more important referendum question from being asked citywide, but also that the public financing question was worded in such a way that (1) it wouldn't work and (2) it required little sacrifice from voters. No big-city or state campaign can be funded by small contributions and a "limited amount" of public money. You need either big contributions or lots of public money. Voters have to be willing to pay for a clean, voter-owned election either as taxpayers or as contributors. It doesn't just happen magically. To pass off a dream as "fundamental reform" is sad, and it gains nothing.